How Can Google's Local Services Ads Affect My Business? It’s undeniable that Google’s Local Services ads (LSA) have changed the way home service businesses advertise online. The pay per lead system designed to provide the end-user with a quick, clean and trusted experience, gives small and medium-sized businesses a better shot at competing with national brands and massive budget operations. It seems that clean end-user experience and an efficient advertiser experience would be a win-win by anyone’s standards. Unfortunately, there is a casualty that comes along with presence and user adoption of LSAs: Google My Business data. Let me be clear, the value of a Google My Business listing and a consistent local presence has not been diminished, just the data. In fact, the value of a local search presence has only increased since the advent of Local Services ads. With LSAs in-market, two main data points from Google My Business Insights are all but likely to decrease in totals year over year: searches and views. On the surface, this seems like a negative trend, especially if overall search volumes have not declined. But when we look at the user experience on a mobile device (where most searches happen), we can understand why. Below we have screenshots of a search for a plumber in an LSA market and non-LSA market. In the LSA market search, we have two visible advertisers, with an option to view more without the need to scroll. In the non-LSA market, we see two advertisers, and the only option to view more is to scroll. If users have the option to not scroll, they are more inclined to take it. This means that users are choosing to view more in the LSA section of the search engine result page (SERP) instead of scrolling. By doing so, the local results are not visible, and unable to collect data on searches and views. Because the combination of Local Services ads and traditional Google Search Ads is pushing the map further down the SERP, it is more important than ever to have a strong local presence. When the users who do choose to scroll get to the map on their screen, your business’s visibility is crucial. Because they’ve been hit with up to 12 options between paid advertisements and the local search results, the need to click for more options in maps is diminished. This is where reviews come into play more than ever. Because reviews are a key factor in local search rankings, as well as Local Services ads, the more reviews you have, the better off you’ll be. Not only will you please the algorithms, but you’ll also please your future customers, and make it known that you’re easy to work with. Each search and view your business captures will be incredibly valuable; taking advantage of it with great reviews just makes sense. I mentioned that there's a potential of 12 possible businesses to choose from before clicking for more options in the maps (or even traditional organic search). You have 2-3 Local Services ads visible, 1-4 traditional search ads, 1-2 local pack ads and 3 local organic results. This means that with an aggressive integrated digital marketing strategy, your business could take up 3-4 placements on the search results page. The key takeaway from Local Services ads is that you need to have an integrated digital marketing strategy in order to capture more leads and grow your business. 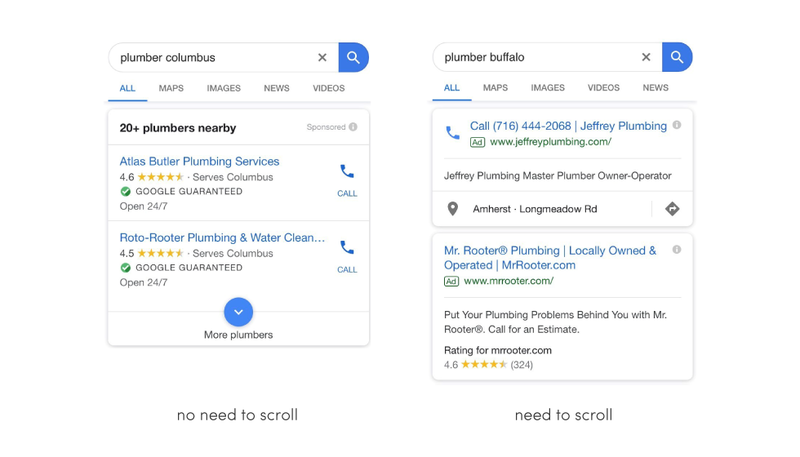 Starting at the top of the page, Local Services ads, traditional Google Search Ads and a strong local search presence, take up as much real-estate on a SERP as possible. For more information on Local Services ads, Local Search and Review Marketing, contact your marketing strategist or request a demo today!